This entry was posted on Saturday, October 4th, 2014 at 1:40 pm	and is filed under new features. You can follow any responses to this entry through the RSS 2.0 feed. Both comments and pings are currently closed. New weather gadget replaced old one seamlessly. Not so with, Stock Prices gadget. It just spins non stop even after I go through edit process. Mark, can you let us know what you mean by “spin”? How about widgets for Reuters, AP and UPI? I know you have RSS feeds for Reuters but that isn\’t good enough. Looks good guys, I am just arriving since they shut down my.msn.com which was my home page for years. I have been with MSN since their inception, not anymore. I am looking for a new homepage and am trying this. Can I get a widget for outlook? I can\’t seem to find it or add it. 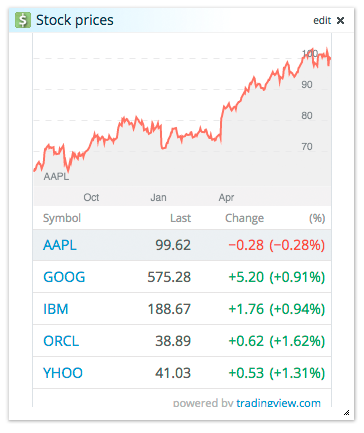 Can\\\’t seem to get the stock widget to show results for certain mutual funds, e.g. VGHAX. Another way to do this? The Stock widget will not show Mutual Funds! (WMFFX, etc). Can you make it do mutual funds? I too have left msn since they done away with my.msn.com. An outlook.com widget would be simply excellent. Need a mutual fund widget as well. The new Stock Widget doesn’t seem to deal with Mutual Fund symbols. Tried it, nothing retrieved. Fund symbols OK?